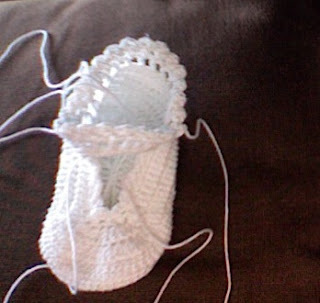 I just have to weave in the ends of the second baby bootie, and then buy the flowers and ribbon. I don't sew, so I'll just send them to the expectant mother. Sewing is too hard for me, which is strange for some people to believe, but it's true. 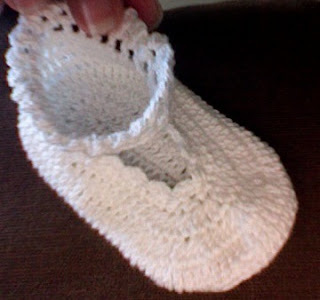 Just because I can crochet does not mean I can sew. 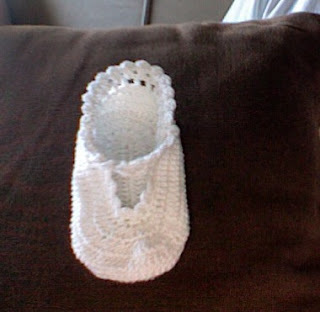 And just because someone can sew, does not mean they can crochet. If you look at it THAT way, then maybe you can understand. When you sew, you are using cloth, material, that's already been created. When you crochet, you are using a fiber to create, either a cloth, or an article directly.